Even though I’m no stranger in the kitchen, there remain a few areas I’ve yet to conquer. I still cannot bake a respectable pie, and since Ed learned this important life skill in college, I rarely bother to try. How many pie bakers does one family need? I am a big fan, however, of that show-off Pie’s less glamorous step sisters, Crumble, Cobbler and Crisp. Unlike fussy pie, which can taste so bad when not done properly, crumbles, cobblers and crisps are kind of hard to screw up. I’ve had good ones and I’ve had great ones, but I’ve never had terrible ones. This recipe I’m sharing is a great one. 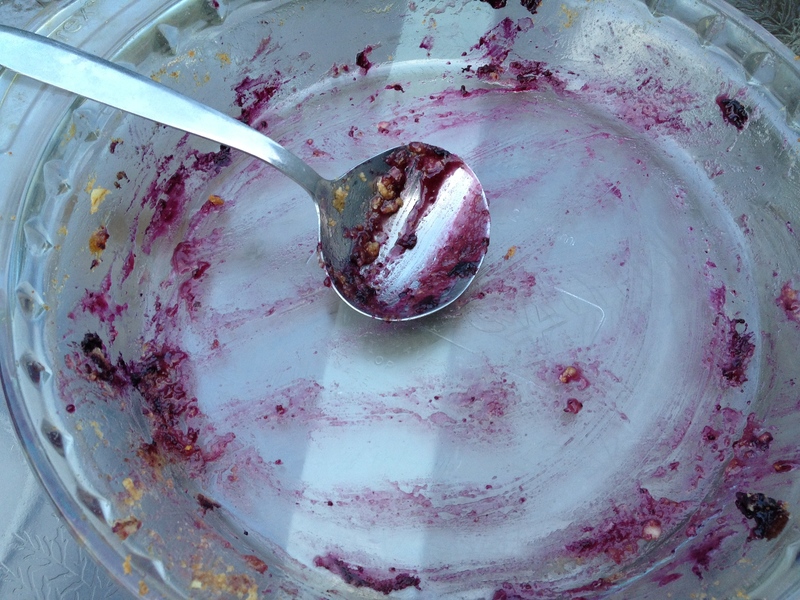 Nate and I made this lovely blueberry crumble yesterday, and it’s as easy as it is delicious. Sous chef Nate suggested adding some cinnamon to the crumble, and I thought that was a marvelous idea. Preheat oven to 375°F. Butter a nine inch pie plate. In a medium bowl, gently combine blueberries, sugar, flour, lemon juice and salt. Set aside. In another bowl, combine all ingredients in crumble except for butter. Thoroughly wash and dry your hands, even if you just did so recently. This is important! Now, with your clean hands, smoosh the butter pieces into the dry ingredients until well combined but still clumpy. Pour blueberry mixture into buttered pie pan. Top with crumble mixture. Bake about 30 minutes, and allow to cool slightly before serving. Serve plain (boring! ), with whipped cream or with vanilla ice cream. As you can see, our family easily devoured this in one sitting — the true mark of a winner! 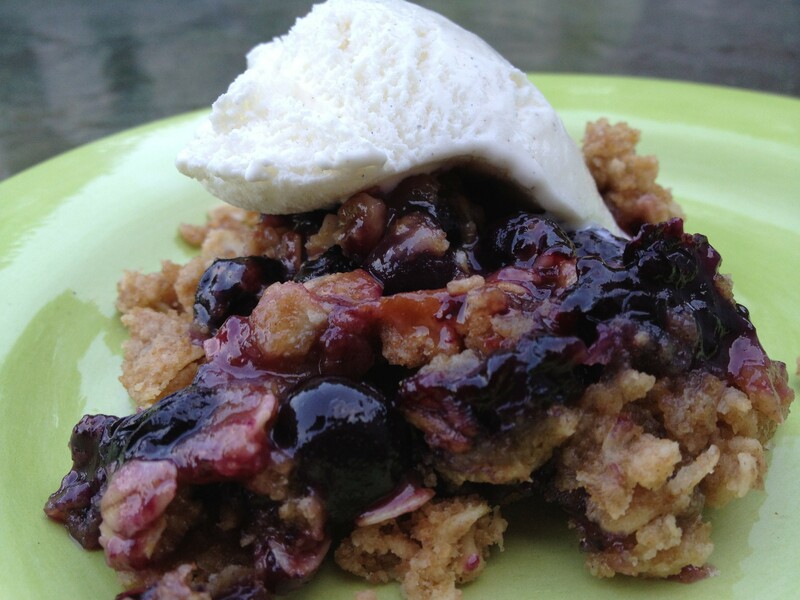 This entry was posted in Desserts and tagged blueberry crumble by Mom Mom's Apron. Bookmark the permalink. We will have to do a gf version of this. It just looks yummy. I love this recipe, I think it’s simple enough for me! !